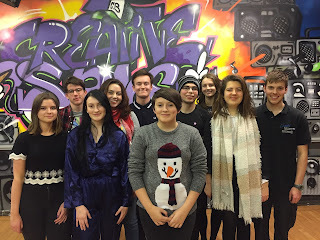 A group of young actors are preparing to tread the boards in a national festival of youth theatre. The senior group of The Customs House Youth Theatre will be taking part in National Theatre Connections for the eighth time in 2018. The group of 15 to 21-year-olds, who meet every Friday at The Customs House, will perform Ceasefire Babies, by Fiona Doyle. The drama is one of 10 new plays commissioned for Connections, the National Theatre’s annual festival for youth theatres and schools, giving young people the chance to experience professional theatre-making. Fiona will direct Ceasefire Babies with assistant director Andrew Finnegan, who is a former member of The Customs House Youth Theatre. The cast are: Aaron Rowe, Adam Ross, Andrew Costello, Daisy Hawkins, Erin Moffat, Fay Hindess, Helen Skipper, Jonathon Graham, Lilly Thompson, Melissa Whale-Spencer, Molly Wear, Morgan Seed and Tia Radix-Callixte. The company are from across South Tyneside, Sunderland and Gateshead. The play will be performed at The Customs House on April 15 and 16 and again between May 8 and 12 at Northern Stage in Newcastle. Ceasefire Babies looks at how we form our allegiances and beliefs. Do we make our own decisions, or do we inherit them? Can a cycle of ideology and disagreement be broken? The issues are explored via the conflicts within one family. For more information about The Customs House Youth Theatre, which is open to children and young people aged 10 to 21, contact Fiona Martin on (0191) 427 8188 or e-mail fiona@customshouse.co.uk.